Hydroxocobalamin is a vitamin found in food and used as a dietary supplement. Vitamin D2 is a form of vitamin D, used as a vitamin D supplement. Thiamine hydrochloride is an essential micronutrient needed as a cofactor for many central metabolic enzymes. (24S)-MC 976 is a Vitamin D3 derivative. Impurity of Doxercalciferol is an impurity of doxercalciferol, which is a synthetic analog of ergocalciferol (vitamin D2), used as a drug for secondary hyperparathyroidism and metabolic bone disease, and it suppresses parathyroid synthesis and secretion. 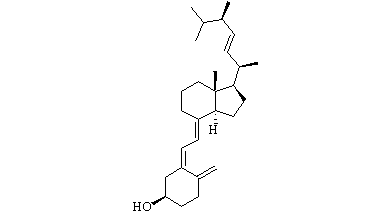 MC-976 is an Vitamin D3 derivative. (24R)-MC 976 is a Vitamin D3 derivative.